Scheduling Employees 4.5 is here! Email your schedules from within the program! Important update- Scheduling Employees now has Email Capability! If you have purchased or downloaded the trial of Scheduling Employees Version 4.0, an important update is available in your account. You will now be able to email schedules to your employees through your Gmail, Hotmail, and/or Yahoo account. Preview or Print before sending reports attached to emails. Send an entire department's schedules to all employees, selected employees, or employees with schedules. I have purchased Scheduling Employees 4.0 or later, or my 30 Day Free Trial of Scheduling Employees 4.0 or later is still active. How do I update my current version? 5.Windows 7/Vista users: Save (not Open) the file SEWSetupv4511.zip to your computer (this may take a few minutes). Once downloaded, right-click the zip file and select "Extract All..." then "Extract" Once extracted, right-click the setup file and select "Run as Administrator," select "Yes" then follow the prompts the finish the installation. 7.If you have purchased Scheduling Employees 4.0 or later, use the same registration code you were issued with the original purchase- you can find it under My Account/My Orders/Your Order Number. Scroll to the bottom of the page, and the code will be listed under the Download button. Contact us via Our Contact Page or email: guia@workschedules.com Please provide us with as much contact information as possible (name, address, phone number). We will forward you your username, then you can perform a password recovery (Select Forgot Password? at the Log In page). This will send a temporary password to the email address listed under your order. Copy and Paste this temporary password and log in with your username. You can then change your password by going to the User Password tab in your account. Welcome to Guia International’s Scheduling Employees, version 4.0! Our award-winning, easy to use scheduling software has just been updated! The introductory rate for version 4.0 is $119.99. At this rate, you will also receive the email version (regular price $149.99, due out this summer) free of charge- a $30.00 savings! When it is released, what features will the “Email” version contain? This simple, easy Scheduling software makes schedules in seconds. Just type in an employee’s name, point the cursor, click, and drag the time bar across a time line. Need to find employee availability quickly? Just click a button and the information appears on the scheduling screen. And, your schedule changes can be saved in HTML format and posted on your web page, allowing your employees to see shift changes and scheduling alterations fast. The process has never been this easy. Scheduling commands and schedule printing functions. Scheduling Employees is easy to use; easy to set up; easy to reconfigure. Scheduling Employees is perfect for restaurants, retailers and service related companies. Analyze labor costs by the hour or the week while you are making shift schedules. All labor percentages are available at your finger tips in seconds. Do you have an employee that works in two different departments? Check for time conflicts in one click. To protect the privacy your data, our software has two levels of password protection should you and/or your managers decide to use it. Generic Name for Employees- Instead of “Employees,” you may wish to change this name to “Cashiers” or “Servers,” etc. This name will replace “Employees” in all menus in the program. 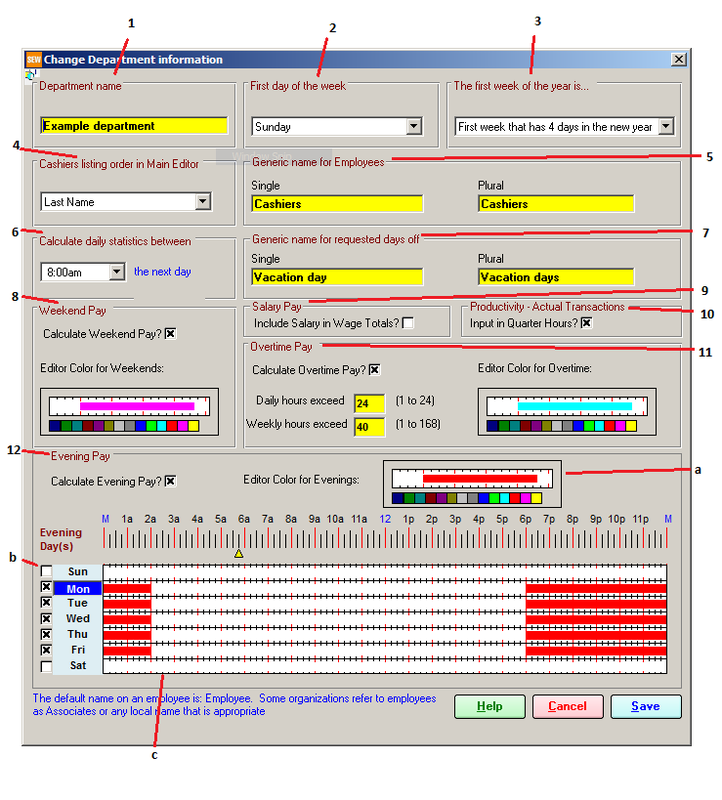 Calculate Daily Statistics between- The Main Scheduilng Editor displays a 24 hour scheduling window. This option allows you to choose which time you would like to the 24 hour window to begin. Weekend Pay- Mark the box if you wish to enable Weekend Pay calculations. You can set the actual weekend pay rates (above the base pay rate) in each Employee Record. ***Note: When marked, Weekend Pay will be calculated from the day you select the box, and will not calculate Weekend Pay for previous weekends scheduled. When you schedule on a weekend, the words “Weekend Day” will appear in the upper left corner of the screen. You can change the color of the words “Weekend Day” to make it more or less obvious. Salary Pay- Select this option if you wish for salaried employee’s wages be calculated in the totals. Overtime Pay- Mark the box if you wish to enable Overtime Pay. ***Note: When marked, Overtime Pay will be calculated from the day you select the box, and will not calculate Overtime Pay for previous days scheduled. You may then set the trigger hours for overtime, as daily and weekly hours. If an employee’s hours exceed either trigger, the employee’s total hours will flag red next to their name in the Main Editor. You can see and edit the Employee’s weekly schedule by clicking on their name. Evening Pay- Mark the box to enable Evening Pay calculations. ***Note: When marked, Evening Pay will be calculated from the day you select the box, and will not calculate Evening Pay for previous days scheduled. You can set the actual evening pay rates (above the base pay rate) in each Employee Record. The largest improvement we've made since our last email in November is the Productivity section. These days, many of you are looking to streamline your business by keeping your labor costs down. Now, with our enhanced Productivity function, you will be able to keep track of your labor percentages, compare projected sales and transactions to actual sales and transactions, down to 15 minute increments throughout the day. We have completed a migration module so that you can convert your current database to the new version in one easy step. You may choose which departments to migrate, and maintain your department settings as well. The last function to be completed is Email capability. With version 4.0, you will be able to email individual as well as departmental schedules to your employees. Copyright © 2011 Guia International Corporation, All rights reserved.